We celebrated the 1 year anniversary of one of our best ski days ever at Saddleback, where we skied 55 trails on opening day with blower powder, by going to Mt. Abram and skiing one trail of man made snow! Regardless of the challenging weather, Mt. Abram was still able to put our a skiable product and we had fun. Look! Snow at Mt. Abram! coverage in the middle of the trail was good. As you got lower down the mountain, the snow coverage was narrower, but still adequate. 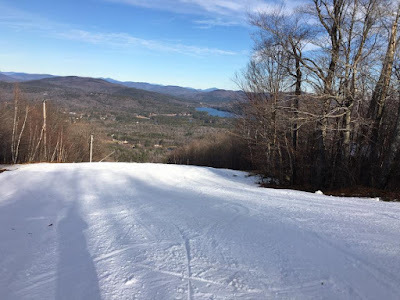 The snow was a loose granular with some icy spots, but there was always piles of snow to turn in so the skiing was remarkably good considering the weather we have had. We arrived around noontime and it was pretty quiet but there were a few skiers making some early-season turns. This weather is a killer for skier traffic. Even with snow, the general population just is not in the mood to ski yet. You just got to power through the bad weather and go support local hills like Mt. Abram making it happen! Mt. Abram has been making a lot of green improvements recently. They have an impressive array of solar panels below the base lodge, and they have recently installed an 'airless' snowmaking system that they anticipate will save $35,000 in snowmaking costs this winter. Here is a link to a recent news article on the snowmaking system. Winter is coming! While we wait we can still ski. Thanks Mt. Abram! Thanks to Mt. Abram for the snow!